Here’s an interesting article from ABC News pointing out how more of our taxpayer dollars are being wasted as “stimulus.” The article focuses on partisan politics, so let me say up front that I have no partisan agenda here. My intention is to examine the economic effectiveness and the integrity of this stimulus spending. Apparently, millions of dollars of stimulus money has been spent by states on road signs designating areas where other stimulus money has been spent. 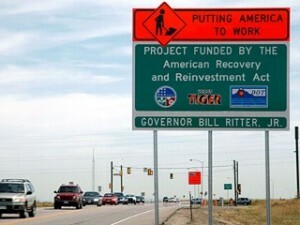 The signs read “The American Reinvestment and Recovery Act” and “Putting America Back to Work.” The estimated tab for the signs ranges between 5-20 MILLION dollars, depending on who you ask. It seems no accident that these signs are popping up everywhere just as the mid-term election season approaches. So, first of all, is this spending about stimulating the economy or is it about politicians promoting their careers and lobbying for your future votes (on your dime)? This is obviously a horrible waste of funding and a failure to create meaningful sustainable work, and from what I have read elsewhere the example is not isolated. This gives rise to another point not mentioned in the article, but which I feel is a fundamental one to look at when examining the effectiveness of stimulus spending. That is the return on the investment. In other words, the potential for the money spent on a project to generate value and income in the future. Too often decisions are made looking only at the short term, and the long term return is not given adequate consideration. There has been a lot of spending on infrastructure, for example, but much of this spending seems to have been done without vision. We’ve repaved roads that don’t need repaving. We’ve built new roads and bridges to outer ring suburbs. How much should we be investing in a petroleum dependent transportation network when we are confronting issues like peak oil and collapsing exurban real estate? Seems like throwing good money after bad. Our stimulus funds should have been spent on businesses that would grow and create more jobs and wealth. We’d be much better served creating a high speed railway system, for example, or solar energy farms all across the sunbelt. These are projects that would actually give us some bang for the buck and move us toward a sustainable future in the global economy. Putting people to work on temporary construction projects is like burning tinder. It’s a quick fix and when it’s over we’ve got nothing left. What if we’d bought a few seeds with that stimulus cash instead? We could grow a forest of tinder and trees. We need to think of the long term. We need to think like investors, not like the addicted consumers we are. And what’s going to happen to all those signs we’ve been throwing up across the country? How long are those viable? Maybe someone will start a business recycling them and lead us out of this recession.